February’s Missha and Hada Labo Haul. Reviews Coming Soon! The beginner stage of the Asian skin care journey can be an expensive one. Skin care is so YMMV that it’s almost inevitable you’ll end up trying and discarding at least a few products before finding the right ones for you. For a few months early last year, I felt like I was constantly receiving packages or waiting for them to arrive. Sample sets like the kind sold by Korean cosmetics shopping sites TesterKorea and RoseRoseShop do make the trial-and-error stage a little cheaper, and cosmetics swaps (and receptive friends) are helpful for getting rid of rejects, but the simple fact is that you’ll probably end up hauling a lot. At least at first. It doesn’t have to stay that way if you don’t want it to, though. Once I established my routine, my online shopping decreased significantly. These days, I only end up doing one small haul a month–if that–and the majority of my hauls are just restocks of products I already use, with maybe one or two new things to try. 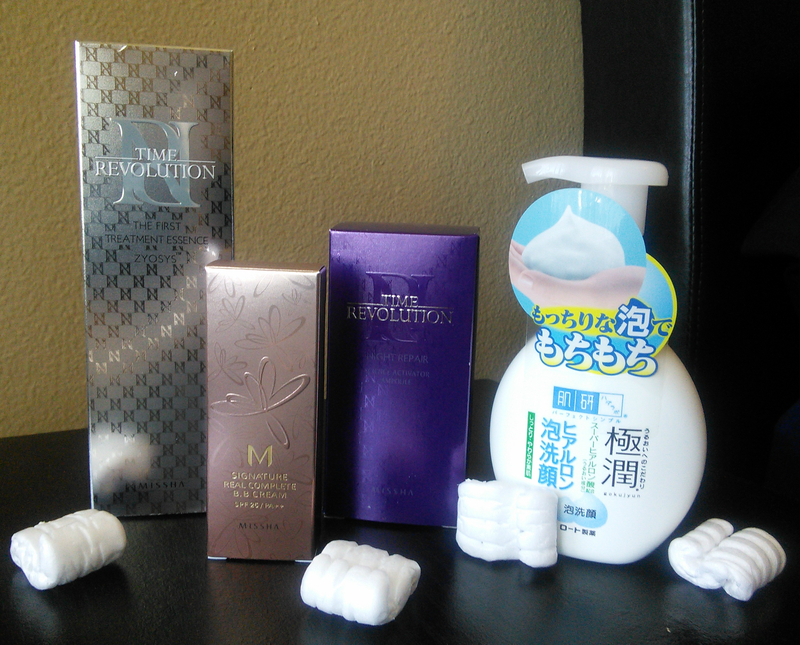 Here’s this month’s haul, which also serves as your sneak preview of upcoming Japanese and Korean skin care reviews! Not pictured: Missha Real Essential Deep Sea Water sheet masks x3, Missha Perfect Cover BB Cream no. 23 samples x 2. The Missha Time Revolution First Treatment Essence and the Hada Labo Hyaluronic Acid Cleansing Foam are restocks. This will be my third bottle of FTE and my second bottle of the Hada Labo cleanser. What I’m really excited about are the Missha Time Revolution Night Repair Science Activator Ampoule (sigh–again with the excessively long product names) and the Missha M Signature Real Complete BB Cream, which was a gift with purchase. Skin and Tonics gave the ampoule a rave review, favorably comparing it to Estee Lauder’s Advanced Night Repair Serum, and called the BB cream “hands-down my favorite BB cream.” I’ve already swatched the BB cream on my jaw, and it looks like the shade I got, No. 21 Light Pink Beige, is a perfect match. Score! I also ordered a few of the Real Essential sheet masks. I haven’t had the best luck with Missha’s sheet masks so far–one of them somehow dried the crap out of my skin so that I had to baby it for over a week to get it back to its normal condition, and the other one I tried was about as useful as a sheet mask soaked in plain water–but I just keep trying. Stay tuned for reviews of all these products! Have you hauled lately? Did you get anything exciting? I’ve heard good things about retinoids, but I’m a bit intimidated by them myself! I have recently added a couple of over the counter retinol products into my routine, though: a Neutrogena retinol eye cream and that Missha Long Name Ampoule in this haul. Seeing subtle but good results so far. Time will tell, but I’d rather not have to go prescription if I can help it!